In one of the closest voting results, Ben Hebert edged fellow Albertan Marcel Rocque as he was named the greatest Canadian male lead of all time. A panel comprised of 31 curling personalities including broadcasters, reporters and elite-level curlers voted in the survey. Rocque actually finished with one more first-place vote, but thanks to Hebert’s abundance of second- and third-place votes, the two-time Olympian claimed a total score of 121 to Rocque’s 101. Neil Harrison, the man who revolutionized the position back in the 1980s, finished third with six first-place votes and a score of 69 while Don Bartlett, the lead for Kevin Martin during his early years, had three first-place votes for fourth. 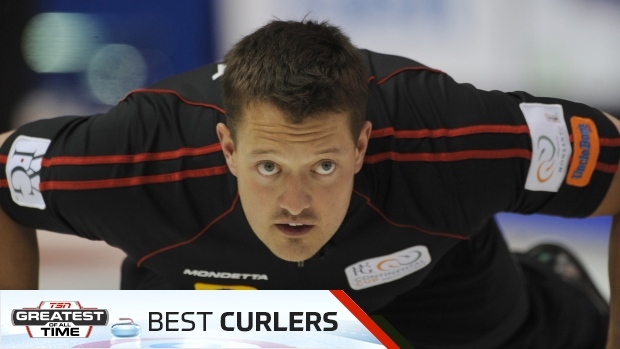 Wes Richardson and Craig Savill were not far behind with 38 and 36 points respectively with three voters selecting Savill as the greatest Canadian lead. A good lead needs to be strong on the brush and have the ability to set up an end with well-placed guards and draws. This is a Hebert staple. Turn on any Alberta game this week at the Brier and there’s a good chance you’ll see Hebert carrying a rock further than anyone could have expected or making a beautiful tick shot late in a game to prevent any sort of big end from the opposing side. A lot of leads do this well, but Hebert does it the best. Known for his intensity and colourful quotes, Ben Hebert has been one of the biggest personalities in curling for years. Now you can refer to him as the greatest Canadian male lead of all time. 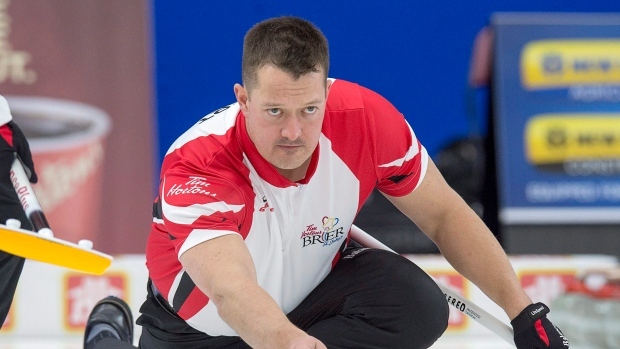 The 2003 world junior champion made his Brier debut in 2005, playing for Pat Simmons’ Saskatchewan-based rink, but didn’t become a household name in curling until he joined Kevin Martin’s super team in Alberta two years later. Hebert, along with sweeping partner Marc Kennedy, won his first Brier in 2008 in Winnipeg and followed that up with his first world championship title a few weeks later in Grand Forks, North Dakota. The Regina native helped Team Martin defend their Canadian championship in 2009 and reached the top of the curling world in 2010 when he captured Olympic gold on home soil in Vancouver. Hebert joined forces with Calgary’s Kevin Koe in 2014, winning a third national title and second world title in 2016. Team Koe claimed the 2017 Roar of the Rings Olympic trials in Ottawa as Hebert became just the fourth Canadian curler to appear in two separate Winter Games. He’s also a 12-time Grand Slam champion. Considered one of the best sweepers in the game by many, Hebert has no problem with showing emotion on the ice. Take the Canada Cup from December, for example, when he was more than willing to reveal his feelings regarding a controversial time violation call. At 35 and still on a great team, expect to see Hebert sweeping his heart out for years to come. One half of "Huff n’ Puff," Marcel Rocque played lead for the best team of the early 2000s. As the first stone thrower for the famous "Ferbey Four," the native of St. Paul, Alta., won four Brier and three world championships over a five-year span from 2001 to 2005. Rocque and second Scott Pfeifer were referred to as "Huff n’ Puff" for their relentless effort on the broom, a major key to their success on the ice. Rocque’s intensity was a curling staple during Team Randy Ferbey’s time on top, no more relevant than during the 2004 Brier final in Saskatoon against Nova Scotia’s Mark Dacey. In the 10th end, Rocque got into it with a fan who was heckling teammate Dave Nedohin. Rocque famously shook his fist at the fan and said "one more time and you’re mine." Dacey scored three in the last end to edge Ferbey 10-9 for their first and only Brier loss. 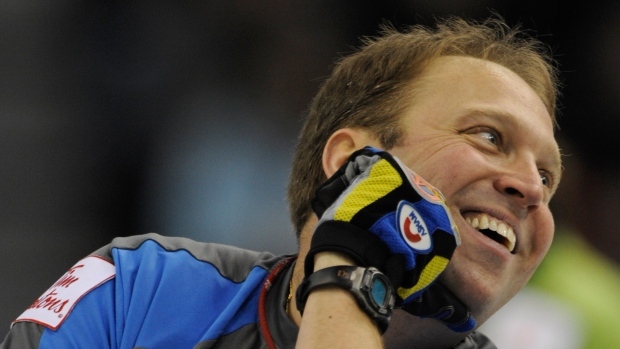 All in all, Rocque captured five medals (four gold and one silver) in five Brier appearances. At 48, the famous lead is still heavily involved in the game as the coach for Ottawa’s Rachel Homan rink. "Marcel’s a great fit for our team. His intensity, his attention to detail – he pushes us to be the absolute best versions of ourselves and he also loves us like his own kids," second Joanne Courtney said at the Canada Cup in December. During his career, Neil "Harry" Harrison was unofficially referred to as the "world’s greatest lead." Harrison won a Brier and was world champion in 1983 with Ontario teammates Ed Werenich, Paul Savage and John Kawaja, otherwise known as curling’s version of the "Dream Team." Team Werenich got back to the Brier final in 1984 but fell to Manitoba’s Michael Riley. He accomplished the national and world feat again in 1990, this time as an alternate. During a time when curling strategy was seldom tweaked, the Peterborough, Ont., native revolutionized the lead position with the introduction of corner guards and perfected the "tick shot." 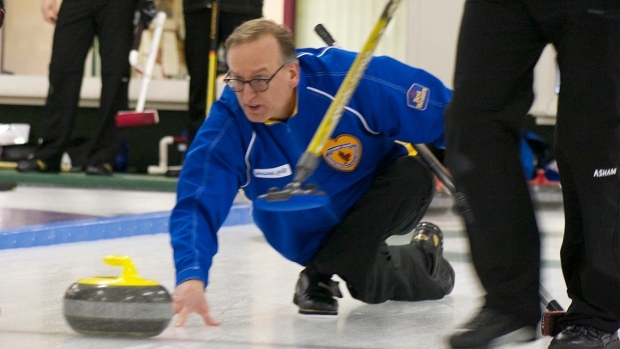 Two-time Brier champion and current TSN broadcaster Russ Howard played two seasons with Harrison in the late 1990s and said Harrison was ahead of his time with how he played the position. "I truly believe he was the first of the guys in the modern era of curling to say that he was going to perfect his position," Howard told Curling Canada in 2014. "It used to be that your lead was your worst curler, where you put your weak link. But he was so good — he made a positive difference on every team he played for." Harrison, who served many years as a fire captain with Toronto Fire Services, was inducted into the Canadian Curling Hall of Fame in 1991 and then the Ontario Sports Hall of Fame in 2009 along with his Brier-winning teammates. After a long battle with brain cancer, Harrison died on Feb. 24, 2014 in his Newmarket home at the age of 65. "He was one of those guys who everybody wanted to sit down and have a beer with," Howard said. Before the time of Marcel Rocque and Ben Hebert, Dan Bartlett controlled the lead position in Alberta during the 1990s. The Edmonton native, alongside third Kevin Park and second Dan Petryk, joined a relatively unknown skip named Kevin Martin in 1991. 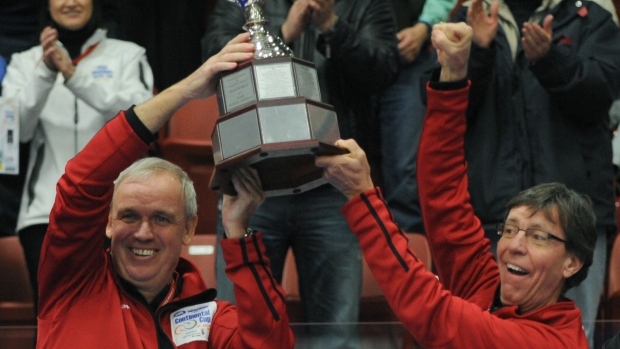 The new foursome won their province’s playdowns that year, punching ticket to the Brier in Hamilton. 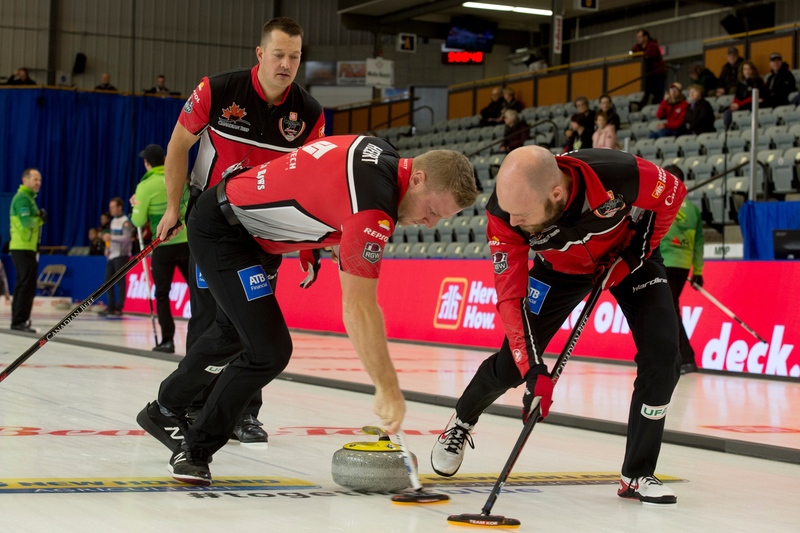 Following a strong 8-3 showing in the round robin, Team Martin were off to their first national final where they defeated British Columbia’s Gerry Kent, 4-3. Bartlett shot an impressive 92 per cent in the game. They settled for silver a few weeks later at the world championship in Winnipeg. After a silver medal performance at the 1996 Brier in Kamloops, Bartlett and company reached the top of the Canadian curling mountain once again in 1997 in their home province in Calgary. On the Olympic stage, Bartlett was a win away from representing Canada at the 1998 Winter Games in Nagano, but fell to Mike Harris in the trials final. Still with Martin four years later, Bartlett became an Olympian at the Salt Lake City Games following a finals win over Kerry Burtnyk at the trials. Team Martin finished atop the standing following the round robin, but lost a 6-5 heartbreaker to Norway’s Pal Trulsen in the gold-medal contest. Canada collectively struggled in the final with Bartlett having the best shooting percentage at 76 per cent. Randy Ferbey and the Ferbey Four dominated Alberta during the early 2000s, eventually resulting in Martin breaking up with Bartlett and the rest of his rink. Bartlett wasn’t with Martin during his world and Olympic championship years, but he was a major stabilizer early on, paving the way for one of the most prolific curling careers in history. Who's your pick for the greatest Canadian male lead?